With even more power than its predecessor, this slimmer DS has a sleek look, thanks to a polished piano finish. Use the built-in wireless mode and Nintendo Wi-Fi connection to play against anyone in the world. Buying a digital camera doesn’t have to break the bank when you don’t need the bells and whistles. With four megapixels and a 4x optical zoom, you can take the quality photos you want, when you want. Chatting on MSN or Yahoo! Messenger has never been easier, with the keyboard that slides out from the side. Take photos with the built-in digital camera and send them to all your friends. LG 9200, $125 with a Fido agreement, $300 without. Reach out and see someone. A simple click starts a video conversation—you can set it to stay locked on you (no matter how much you move around), and you can personalize the effects on your video calls. They may not look it, but these small speakers can produce a lot of sound, making them ideal for your PC at home. 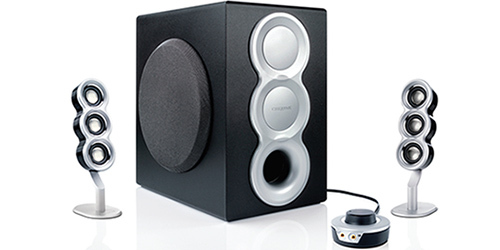 They pack 40 watts (balanced accurately over both speakers), and come in black, silver, and red. Creative Labs I-Trigue 3400, $115. Find out how far you run (or how many steps it takes to walk home from school) while making a call or listening to your favourite MP3s. Take photos with the VGA camera and fill up the 512MB card with at least 100 songs. Sony Ericsson W300 Walkman Phone, $100 with a Rogers agreement, $290 without. It may look like a kid’s toy, but this pen can solve math problems and even remind you when you have a test coming up. It’s even got its own voice and plenty of different games.